Autonomy is a characterizing notion of agents, and intuitively it is rather unambiguous. The quality of autonomy is recognized when it is perceived or experienced, yet it is difficult to limit autonomy in a definition. The desire to build agents that exhibit a satisfactory quality of autonomy includes agents that have a long life, are highly independent, can harmonize their goals and actions with humans and other agents, and are generally socially adept. Agent Autonomy is a collection of papers from leading international researchers that approximate human intuition, dispel false attributions, and point the way to scholarly thinking about autonomy. A wide array of issues about sharing control and initiative between humans and machines, as well as issues about peer level agent interaction, are addressed. 1. 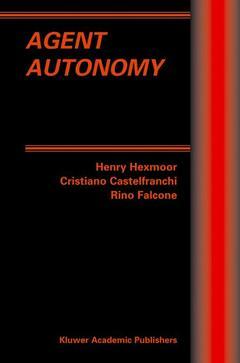 A Prospectus on Agent Autonomy, H. Hexmoor, C.Castelfranchi, R. Falcone Autonomy: Variable andGenerative, M. Luck, M. D'Inverno, S. MunroeRepresenting and Analyzing Adaptive Decision-Making Frameworks,K.S. Barber, I.M. Gamba, C.E. Martin QuantifyingRelative Autonomy in Multiagent Interaction, S. Braynov, H.Hexmoor Obligations and Cooperation: Two Sides of SocialRationality, G. Boella From Automaticity toAutonomy: The Frontier of Artificial Agents, C. Castelfranchi, R.Falcone Adjusting the Autonomy in Mixed-initiativeSystems by Reasoning about Interaction, R. Cohen, M.Fleming Interacting with IDA, S. Franklin, L.McCauley Policy-based Agent Directability, K.L. Myers,D.N. Morley Adjustable Autonomy for the Real World,P. Scerri, D. Pynadath, M. Tambe AdjustableAutonomy and Human-Agent Teamwork in Practice: An Interim Report onSpace Applications, J.M. Bradshaw, M. Sierhuis, A. Acquisti,P. Feltovich, R. Hoffman, R. Jeffers, D. Prescott, N. Suri, A.Uszok, R. van Hoof. Index.